Books available on April 15, 2010. 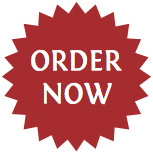 Mr. Carmichael will sign all copies of the book ordered through this website. Excilin cloth case, Smyth sewn, in an Excelin stamped slipcase. 100 printed, $150.00 SOLD OUT! Quarter bound blue Saifu cloth case with gold stamped leather spine and four corners with bumps on spine. Saifu cloth wrapped gold stamped slipcase. Each copy signed and numbered. 8 by Carmichael is a collection of articles that have been primarily written over the years for the Anglers' Club of New York Bulletin. Four of the pieces are stories, remembrances of men and fishing trips, both fresh and salt water. There is an interesting article warning anglers to conserve weight (reel and reel seat hardware) behind the casting hand rounding out the initial four. 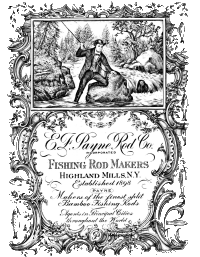 The four biographical pieces start with a short article on the author of The Modern Dry Fly Code, Vince Marinaro, also a rod maker, whose friendship extended beyond the numerous visits to Carmichael's workshop. There is a piece about Chauncy Lively, also a good friend of Carmichael's, and one of the great, innovative fly tiers of the 20th century. Some of the photos show examples of his work, and this article helps clarify the legacy of this kind and generous man. The remaining two articles concern rod makers: Dr. George Parker Holden and Ed and Jim Payne. Dr. Holden wrote what was for year considered the “bible”, The Idyl of the Split Bamboo, a valuable guide for those interested in hand planing split bamboo fly rods. In his later years, his prize student was Everett Garrison. The final piece is about the great father/son tackle makers, Ed and Jim Payne. For the first time here their work is chronicled in a fifty-page article with eighty photographs, many of which have now for the first time been published. The contributions of these men collectively are, in the author's opinion, unmatched in the Golden Age of tackle making, and this biography sheds much new light on their achievements. 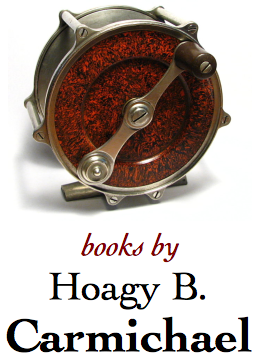 Contact Hoagy. Copyright ©2007-2016 Hoagy B. Carmichael. All rights reserved.